Some actions in OroCRM trigger other actions. This behaviour is pre-defined at the background and can be modified in the course of the system integration. Mostly, this actions are related to OroCRM extensions. 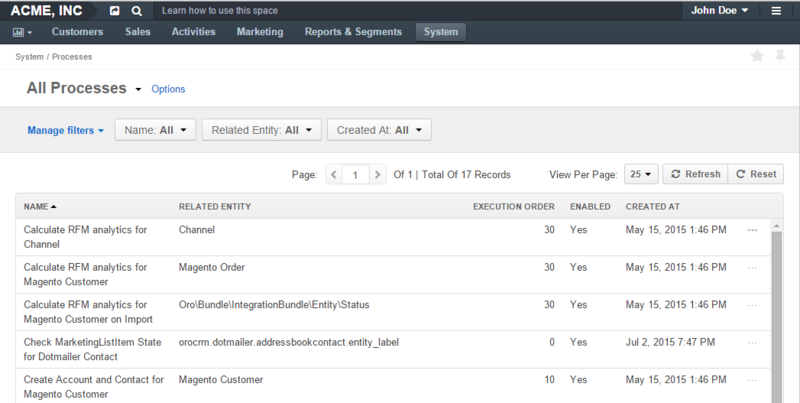 For example, as soon as a new Magento Customer has been uploaded to OroCRM, an account and a record are automatically created for it, and if a new campaign has been created in a Dotmailer address book synchronized with a marketing list in OroCRM, a new Email Campaign record is automatically created in OroCRM. You can view and activate/deactivate the process in the OroCRM UI. To view the processes, go System → Processes. NAME Defines the process available in the system. RELATED ENTITY OroCRM entity, records of which are influenced by the process. EXECUTION ORDER Priority of the process execution. The smaller is the number, the higher is the priority. If several processes have been triggered simultaneously, the processes with a higher priority are executed first. ENABLED If set to Yes, the process will be executed. CREATED AT Date and time when the process was added to the system. Click the action icon on the grid to get to the View page of the process an see its details. On the View Page you can see the basic process details (as in the grid) and the Process Triggers, i.e. in what case and with what delay after the event the process will be executed. The only action available from the UI is enabling/disabling the process. This can be done with Activate and Deactivate buttons on the View page or and icons on the “All Processes” grid.